Posted by Andrew Whyman under Hybrid & EV Vehicles, on 12 November 2016 @ 11:48pm. 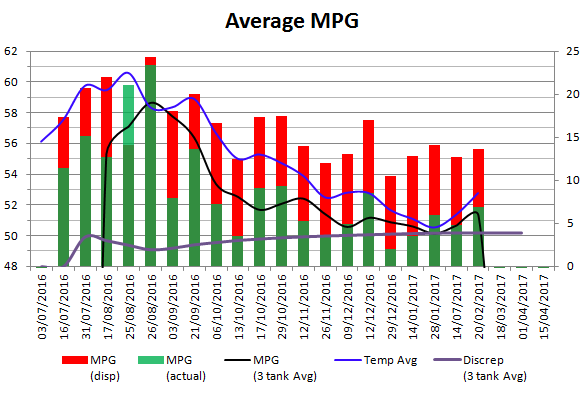 I have a slight obsession with my MPG and I’ve been tracking it regularly using Fuelly.com. What I have noticed is now that the weather is beginning to get cooler the average MPG is getting lower. I expected this would be the case when I got the car so it’s not a shock to me. However since I was tracking the MPG anyway I decided to also track temperature too. As you can see clearly, the average temperature (blue) has been dropping as we enter autumn/winter, and the average MPG (black) has also begun to drop as well. The engine runs less efficiently when cold and it takes longer to heat up, so extended warm-up times means it runs less efficiently and for longer. The engine must run even when its not moving the vehicle to generate enough heat for the climate control, so the vehicle occupants can stay warm. The hybrid battery is less able to provide power when cold, so it doesn’t help as much. However it is surprising that on a short 15mi journeys, which is what 90% of my journeys are to work during the week, that I am still managing over 50mpg. Not bad for a 1.8L petrol! Some diesels would be lucky to see that, and a non-hybrid petrol wouldn’t come close. I’ll continue to log this as we go into winter and it gets colder, and I’ll make a further blog post in the future. I do suspect that I will see a dip below 50mpg at some point when it gets colder, but for now it’s still impressive. The Passat, even for a diesel, was lucky to average 46mpg during summer and got even less in winter.